One of the many pleasures rock-and-roll affords is that of rooting for the underdog. The story is familiar: you get knocked out by an unknown or unpopular group, so you buy their infrequent albums with an almost religious fervor and make a nuisance of yourself by playing the B side of one of their flop singles for all your friends who really only want to hear Neil Young for the 800th time. If you're a real zealot, you also put out a fanzine devoted to your idol's career (or lack of one) and write nasty letters to Rolling Stone. When the group finally clicks, you smile your best I-told-you-so smile. If, instead, they fade unheralded, you wipe your nose, mutter "ahead of their time" under your breath, and feel sensitive. A wonderful game, because you can't lose. Just about every real rock fan of my acquaintance has at least one such mania to his credit. Myself, I used to conduct lonely vigils at record stores for Kinks albums - this in the days when their sales were so uninspiring that Reprise was seriously considering dropping them altogether. Now, to the delight of RCA, their cult following has expanded to the point where they've become a viable commercial entity, and I figure my taste is an idea whose time as come. 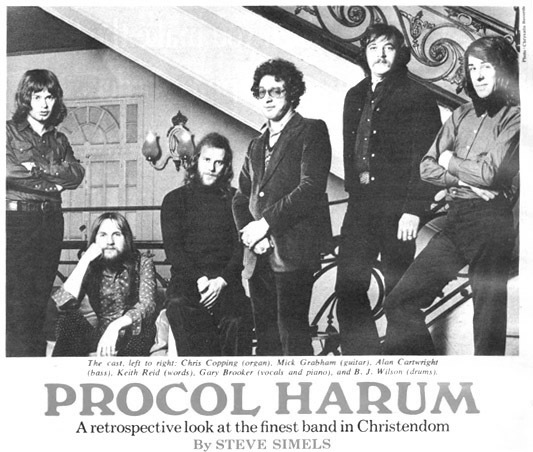 More recently much the same has begun to happen to Procol Harum, another cult band that many of my critical confreres have been pulling for since 1967, but with a notable lack of success. Yet, as of this writing, the group's sixth album (seventh, if you count their released-only-in-England greatest hits collection), "Live in Concert with the Edmonton Symphony," is in Billboard's Top Ten, the first such achievement in their history, and "Conquistador," the single excerpted from it, is doing similarly boffo biz. This radical reversal of the band's fortunes is especially odd in the face of the current trends toward anti-intellectualism (now manifesting itself in the rock press) and extravagant theatricality (now being demonstrated by the likes of Alice Cooper, David Bowie, and, most stunningly, in the last Rolling Stones tour). The Procols, image-wise, have always tended toward invisibility. Their act, such as it is, is limited to an occasional one-liner from pianist Gary Brooker, and what little glamour surrounds them stems from the compulsive morbidity of lyricist Keith Reid, about whom fans play a little guessing game: is he as screwed up personally as his work indicates, or is he not? I once did an interview with them during which Reid spent the whole time huddled in a corner babbling to himself, and this kind of behavior, while perhaps interesting in itself on a number of levels, is nevertheless not quite the stuff of which pop stars are made. And though, being British, they do possess a sort of built-in flash, by and large there is really nothing terribly impressive about them - except their music. But despite an occasional demurer from people who should know better (I think of Nik Cohn's brief dismissal of them as one-hit wonders in his "Rock from the Beginning," or the remark by Robbie Robertson of the Band - with whom they're often and superficially compared - to the effect that everything they do "sounds vaguely like that Percy Sledge thing"), that music is as significant a body of work, in terms of emotional depth and all-around rock-and-roll smarts, as can be found in contemporary pop. For those of us who've been convinced of this all along, their metamorphosis into genuine headliners is, in many ways, a vindication. The question then becomes, where have they been all your life? In 1969, David and Matthew departed, to be replaced by one Chris Copping, a tricky lad who could play Matthew's organ lines with one hand while negotiating a keyboard bass with the other. As a four-piecer, the band recorded "Home" and "Broken Barricades," and it became apparent that most of the weight had fallen on Robin. Whereas previously he had functioned almost exclusively as a solo voice, he now unleashed a scathing Hendrix-style attack that more than compensated for the reduction in manpower and began to gain him a measure of notoriety. We can, with some justification, label this the band's Blue Period. Finally, last year, the inevitable happened: Robin, visions of superstardom dancing in his head, trotted off to form his own ensemble, and was promptly replaced by David Ball and a new full-time bassist named Alan Cartwright. Full circle, with their original instrumentation intact, it was this band that moved out to cut the live effort which has so unexpectedly propelled them into the public eye. The convoluted game of musical chairs might well suggest we have several Procol Harums to deal with, but remarkably, the sense of continuity from record to record is very strong. This is not to say that they haven't experimented or grown (their other stuff, such as the forthcoming "Grand Hotel," is increasingly full of conscious attempts at non-mould material), but rather that a particular vision has guided the band since is inception. That vision, not surprisingly, is most formally exemplified by the music of their debut album, titled simply "Procol Harum." Procol was not the first to attempt the elusive fusion of rock and classical techniques, but they are still the only ones to have pulled it off, and never quite so effortlessly as they did in that seamless merger of Bach and Ray Charles. One recalls the similar attempts at fusing "serious" music with jazz - the Third Stream of Gunther Schuller and others - and more recently the work of such rock bands as the Nice and King Crimson. It's generally agreed that what resulted in all these cases was a basically sterile music in which the two styles never really meshed, but merely alternated with each other. Procol Harum never fell into this trap - largely, I think, because first and foremost they're rock-and-rollers, and they consequently adopted only those elements of classical music that are most compatible spiritually with those of rock, the harmonic language and the tight structure in particular. With this in mind, the quintessential Procol Harum track would have to be "Repent, Walpurgis," a shattering instrumental from that first album in which, against a melancholy Bachian organ-and-piano background, Robin Trower's guitar screams out in the purest kind of rock-and-roll language. The juxtaposition is moving in the extreme. Overall, his viewpoint is unrelievedly pessimistic; in fact, his lyrics of late have been sicklied over with such an alarmingly graveyard cast that the band (which considers him an equal member, incidentally) reportedly postponed an album until he could turn out something a bit more upbeat. All that was written a couple of weeks ago and, as the alert reader will know, a great deal has gone down since then. God knows what may happen before this finally sees print (I am adding this postscript in early November), but as we go to press, this is the scoop: the band is now on the WB/Chrysalis label, A & M is reissuing the first album and "A Whiter Shade of Pale," and - most important - they've shuffled lead guitarists again. Ball has apparently pulled an Eric Clapton, quitting the now successful group to play the blues, and his replacement is Mick Grabham, formerly with an English country band called Cochise. How the personnel change will affect "Grand Hotel" is at this point anybody's guess, but I can report that in concert, at least, things are working out just fine. Stay tuned. Thanks to Diane Wells for typing this out!